Paul Brennan, branch manager of MKM, Alnwick - the cup's main sponsor - with fund chairman Scott McEwan. The Stephen Carey Memorial Cup Final is being held tomorrow (August 5) at North Sunderland FC's ground. 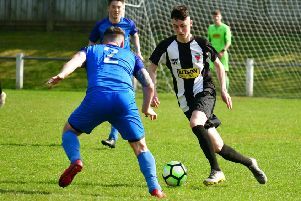 This year, the final will be between Tweedmouth Harrow (NNL League 1 winners) and Amble St Cuthbert (Bilclough Cup winners) at Seafield Park, Broad Road, Seahouses. Kick-off is at 6pm. The fund owes a massive thank-you to Alan Macfarlane and the committee of North Sunderland FC for allowing the final to be held at their ground at short notice. Refreshments will be available on the night and it is hoped a good crowd will be in attendance. Entry fees are £2 for adults and £1 for kids. A raffle will also be held and the money raised will be shared with the FA Benevolent Fund for injured players. The final is sponsored by MKM. The Stephen Carey Fund was launched in February 2013 in memory of Stephen Carey, 21, who died while playing football in July 2012. Stephen was playing a pre-season friendly match for his local village football team, Alnmouth, when he rose to head the ball and collapsed as he landed. Despite the efforts of players, coaching staff and supporters, Stephen never regained consciousness. It was later revealed that Stephen had an undiagnosed heart condition and this was likely to have been triggered during the exertions of the match. Becoming a fully registered charity in September 2014, the Stephen Carey Fund recently provided its 100th community defibrillator, the majority of which are in cabinets and available to the public 24/7.